Although I think MKRC may have raced at the Head of the Trent before (a long time ago, before my time) this was certainly the first time we’d entered more than one crew. Stepping up a level to a regional event, we had four boats out – considering the strength of the event, to then head home with two wins was very pleasing indeed. 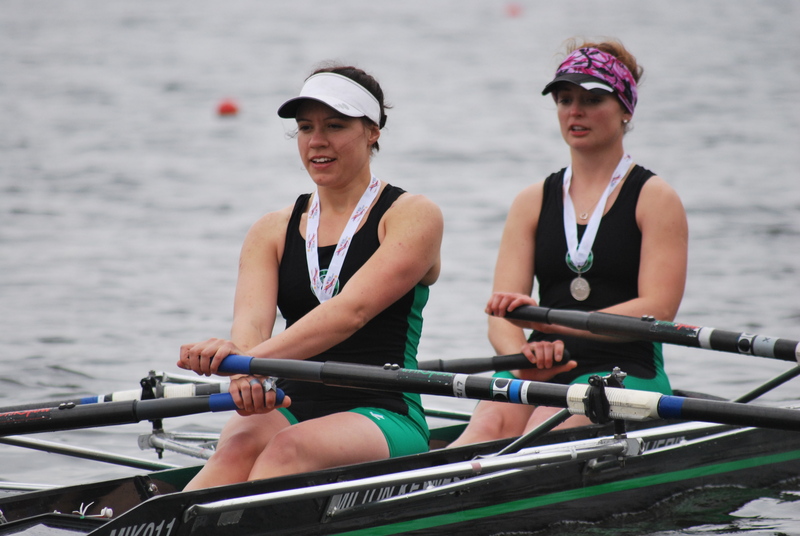 The women’s eight also put in a very fine performance, coming third in the W.IM2 8+ category, of eight crews. This was a strong looking quad, with Helen M stroking, Liz steering and Jenny and Andi making up the crew. They had just one boat as competition, from Tyne, and they were drawn immediately behind our ladies. From the start, our boat pushed away hard and felt they were easing away down the course. This proved to be the case, with our time of 20:38.4 enough to win the event by nearly 30 seconds. This event gave us the opportunity to reprise our Master’s quad, with Pierre-Yves, Tim, Steve and I. We’d got two other crews in the category, but as these were both “D” and we were racing “C” were acutely aware of the need to not only race the others but also try to overcome what had to be a big handicap time. We boated early, to allow us a stress free run up to the start, giving time to warm up well and put in a couple of race bursts, which seemed to go well. With three of us never having done the event before, we had no idea how far it was to the start; answer, a long, long way! After what seemed an eternity, we finally went under a bridge and there were some guys putting up the “start” banner. Having no idea about the marshalling positions, we drifted to a halt before noticing a couple of boats further up, so we moved up to join them. With no marshals to be seen we hung around for a while but boats with lower numbers started going past, so we paddled off again. Finally, we passed a sign with “1”, then one with “11”, so figured these must be marshalling positions – we were crew 58 so had even further to go (although the next board was another “11” which kind of confused us). Much, much further up the river, we then found “51” and tucked in there – Pierre-Yves then telling us we’d sculled 1.5 km from the start! It was then a case of settling in and waiting for the rest of the crews to arrive. Keeping station was interesting as the stream was running pretty quickly, but we managed to latch on to the bank. Presently, our two opposition boats arrived, Peterborough and Nottingham and Union. Overhearing one of the other crews discussing how to help out with steering and the other saying they’d been beaten by them earlier in the season did give us a bit of confidence – but there was still the handicap time issue. It was all very pleasant sitting there in the early Spring sunshine, very peaceful and (partly because it is such a wide river) none of the usual ineptness you see at the start of a Head race. Finally, we saw the front crews start to spin, so time to de-kit and get set. Easing out into the stream, we spun easily and paddled off gently – after all, we’d got over 1k to the start! The stream really was running fast and even at light pressure, we were starting to move. Approaching the start, we wound it up and hit race pace a couple of strokes before the “go”. Almost immediately through the first bridge, we were into dirty water, catching the Loughborough Ladies eight who were immediately ahead of us. To their credit, they kept out of our way and we powered past, settling into a good rhythm and rate, for the next 6 kilometres. Although Steve had never steered this river before, he did a fantastic job, keeping a tight line throughout and making sure we kept clear of all hazards. Coming down the straight stretch towards Trent Bridge, we again started getting dirty water. This time it was a Yarm quad, who needed a gentle call to make sure they didn’t squeeze us going through the bridge. Fortunately, they got the hint and eased over, allowing us through to take our second crew. Passing Nottingham Forest’s ground we were into the last kilometre, but by now it was starting to hurt. To add to this, there was yet more rough water though, as we were now hard on the heels of a composite eight – they in turn were pushing off of us! Consequently, we raced them all the way through to the finish line, getting overlap but not quite pushing ahead of them – still, we counted it as another pass! Quite a relief the hear the hooter as we passed the line – encouragingly, our oppositions boats were nowhere in sight, so we were hopeful that we’d pushed hard enough to overcome the handicapping as well. A light paddle back to the boating area (much harder than it sounds – this was against the stream and we were all pretty tired) and out; then the wait for the results. One of the nice things is that they run the event with all competing crews in the same division – this means not only do all crews have the same conditions, but that we didn’t have to wait until the final division to get our result. When this came up, we found we’d won the category in a time of 19:36.1 (19:04.7 adjusted for age) with a comfortable gap of 1½ minutes – even with the 30 seconds or so handicap. Naturally, very pleased with this, both the result and what has to have been one of our best rows to date! This four, of Tim, Josh, Chris and Benn, coxed by Helen M (smaller and louder than the alternative of Steve) were always going to be up against it. With their only competition being half of the Star Club Elite Eight and our guys having just a handful of outings together, it was a real mismatch. Despite this, they gave it a real go, and pushed Star hard even though they were overtaken by them. With pretty much the crew for the WEHORR, with Lindy and Karen sitting in for Helen J and Emma, this was going to be a good benchmark against some serious competition. With a few nerves showing, the ladies got boated early for the long paddle up to the start. Earlier plans to try and borrow a lightweight boat had been thwarted by the weather (not enough water time to get the boat kindly offered by Northampton RC rigged for them) so it was the somewhat heavy John Cunningham they were using. After waiting on the bank for what seemed an eternity, I finally saw the distinctive green blades flashing in the sun, as the girls came into view. Looking far neater than many of the other eights going past they powered past me just before Trent Bridge. With Andi doing a great job of coxing (again, first time on the river), the crew of Liz, Jeny, Kate, Alice, Lou, Karen, Lindy and Paula (in a very unfamiliar bow seat) put in a great row, overtaking a couple of crews on their way to a time of 20:04.2 and a wonderful third place in the category. I really enjoyed the event, although the weather certainly helped. It is a good course, quite challenging but a bit more interesting than most head courses (but very long). I do like events that put all competing crews in the same division – it does mean you all have the same conditions (having seen a head wind swing round to a tail wind at Bedford before now) so it is far more even and fair. It also saves the sitting around waiting to see if your time from Division one gets beaten by a crew in the final division. They could do with a bit more organisation though – having overshot the trailer park entrance as there were no signs in to it at all and then had to go for a tour around Nottingham, the guy on the gate told us to head into the trailer park where we’d be directed where to park. No, no-one on duty at all, so it was a bit of a free for all with trailers dumped everywhere and anywhere. This, inevitably, led to one club setting up camp in the narrowest part of the park, the passageway through to the river. Showing a lack of respect for everyone else, they then proceeded to block off the sole access except for a narrow path allowing one boat through at a time – thanks guys. Directions to the clubs weren’t brilliant – I’m still not sure which club we were meant to be using for coffee, loos, etc. There was plenty of boating area though (although getting out early definitely helped) and a really nice stretch of river, wide and peaceful. Once we’d figured out the waiting positions at the start, this made sense, although having a few more people up at the start might have helped. Everyone we came across was friendly and helpful– and I guess coming away with a couple of wins really helps, especially with the rather neat ceramic pots, a pleasant change from the usual pewter ones. 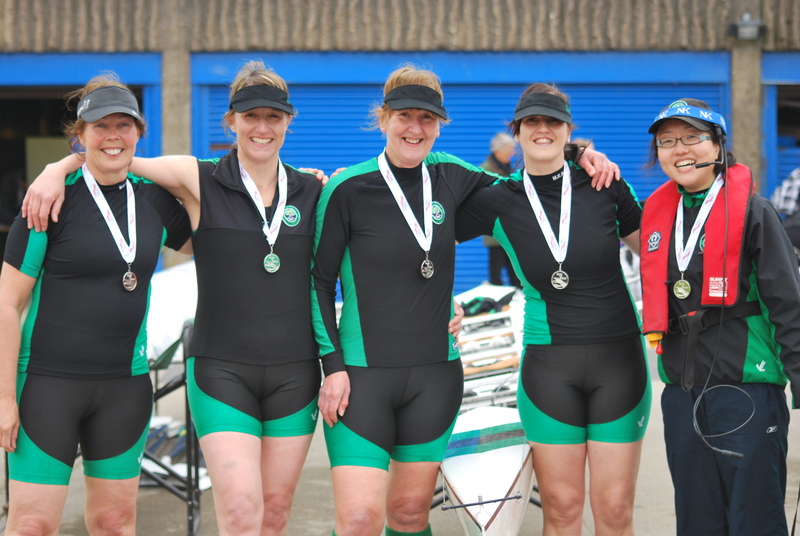 All in all, a great day out, rounded off by daughter Jo also picking up a win in her Nottingham Uni quad – fortunately for all, none of her crews were in the same categories as MKRC so no split loyalties on this occasion. This year’s Northampton Head took place in unusually mild weather – we’re used to fun activities like breaking the ice on the side of the river and avoiding hypothermia while waiting for the start, so temperatures of a tropical 5-6 degrees were really welcome. We had our usual strong entry out for the event, including another batch of Learn to Row graduates in their first ever races. Despite missing some of the stronger members of the squad and having a number of our top boats knocked out with no competition, we still left clutching four category wins. A new combination saw Nelson, Chris Rob M and Pierre-Yves, coxed by Karen set a good benchmark for the Novice men, of 6:47. This was good enough to see them finish 3rd, beaten by Leicester and Bedford School but only seven seconds adrift of the winners and ahead of three school crews. A first race for Ben S saw him stroke a Junior double with Alex. Despite being overtaken by two old boys (see below) they put in a very good race, good enough to win their category! A very impressive start for Ben, especially considering the pressure of stroking the boat having never raced before. Fresh from our win at Star in the previous week, Steve and I knew this would be much harder as we were up against long time rivals, Nemesis. Today’s race felt much better, picking up from the tail end of last year rather than the rusty performance at Star. A fast start saw us close down on the kiddies in front (Ben and Alex in the J18 double) pretty quickly and we were able to cruise past them. To their credit they then hung on to us and pushed us all he way to the finish. Steve steered a near immaculate course and this helped us to a time of 6:57. Not surprisingly, Nemesis did beat this but by a mere 8 seconds – a much smaller gap than in previous events and leaving the pair of us quite happy. An interesting race this one for Helen M and Jenny. Originally entered as a Masters boat, they had no competition so had to row at IM2 level. A “normal ” MKRC crew, in that they’d only had one or two sessions together before racing but both are very good scullers. After a slight problem on boating (another MKRC crew had inadvertently taken their blades!) 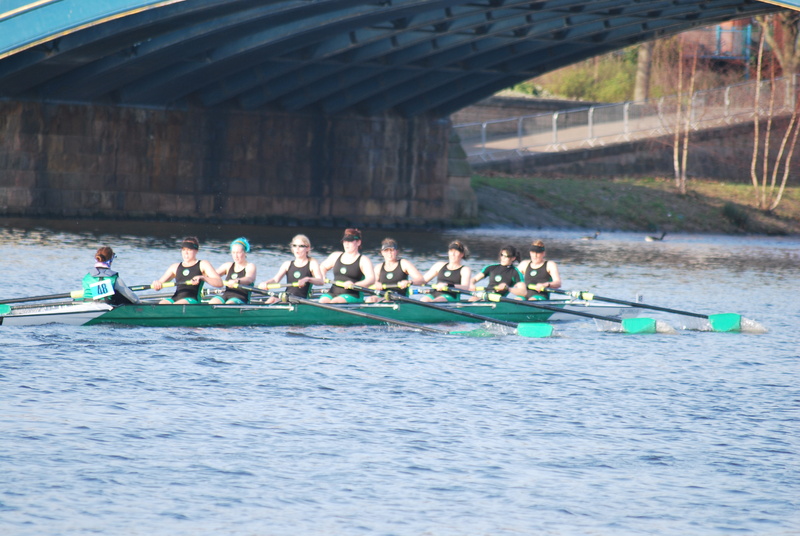 they had a good, steady start, before they had the misfortune to be caught by a J16 4+ boat – which, despite being coxed, promptly rowed into them, having pushed them over to the bank first! Despite this setback, the ladies got going again and with the incentive to catch up lost time, stormed down the course to finish as winners, their time of 7:31 putting them just three seconds ahead of Leicester, with Devil’s Elbow (love the name!) well back. This was a quartet of our Learn to Row graduates form last year, in their first race as a crew. Comprising Winnie, Kelly, Mary and Helen C, with Tim coxing, this was a “voyage of discovery”. Unfortunately, they set themselves a tough pace from the start, but the race distance was double the length of the lake and it told towards the end. Still, a good learning experience for them and that’s the first race out the way. With Phillip still being a beginner in the single, the main objective was a safe row, finishing the right way up! He managed this easily and although last by a fair margin, a creditable performance for someone still finding his way. Two junior girls’ doubles out in this category. First up were Lainey and Alex setting a target time for the other competitors of 8:17. They held on to the lead until division four, when their clubmates Gemma and Hannah posted a time 15 seconds quicker; unfortunately, two Stratford boats went even quicker! This left our two crews in 3rd and 4th overall (out of seven entries), an encouraging trend up the results table. Our junior girls provided no less than three of the five entries at this category. They finished 2nd, 3rd and 5th overall, with Lainey top of the MKRC juniors, only 13 seconds off of the winner from Oundle. Yes, really, MKRC entering a Men’s Novice eight! With a large influx of Learn to Row graduates, we were able to put out a complete novice crew, bolstered by some of our senior guys who haven’t yet had the good fortune of a regatta win. A credit to the club and the coaching they’ve received, they put in a really good performance, posting a time of 6:29 to finish 4th, behind Stratford, Bedford School and Leicester boats. Given this was the first race for many of the crew, this was a very encouraging start for Nelson, Chris, Rob M, Ben S, Antonio, James, Haemish and Geoff (last five being LTR grads), coxed by Karen, being just 23 seconds off the winners. This boat saw Pierre-Yves, Tim, Steve and I reprise our Henley Masters boat from 2010 – and we don’t think we’ve been out in this combination since! We started immediately in front of one of our two competitors, from Northampton, and this gave us a good focus for the race. The first part of the race felt a little sluggish, as we got used to sculling together again, and the Northampton boat clung stubbornly behind us. However, about a third of the course down, we pushed and upped the rate a bit and this saw us at first ease away from Northampton but then start opening a substantial gap. By three quarters, Steve and I were both glad we’d not been able to enter an impromptu mixed quad in the previous division – doing just the two races was seriously starting to hurt! Still, we clung on in there and get pushing hard, crossing the finish line to record what we felt was a very respectable time, of 6:08, well ahead of Northampton, on 6:37. We then had to wait for our other competitor (Hollowell Scullers), out in the next division. To our disappointment, they absolutely flew down the course to post a winning time of a staggering 5:54, beating us by 16 seconds. Fresh from her storming performance with Jenny in the double, Helen M was back in action in her single. After a late drama, as her seat had somehow disappeared (a big thank-you to Northampton for finding and lending her a spare for her Empacher) she duly delivered another win for both her and the club. Alex moved from the winning double back to his single in the last division. Showing steady progress, he finished third out of five, in a very symmetrical field (Stowe, Northampton, MK, Northampton, Stowe) pushing the Stowe boat that followed him well away. Another great day out at Northampton, despite the unusually warm weather (we’re so used to freezing there, being warm felt distinctly odd). It was really impressive seeing our huge flotilla of boats taking up substantial acreage in the boat park, having something like 12 or 13 different boats entered ranging from singles through to an eight. Great also to see so many new faces racing for the first time, and all of them enjoying the experience (even if a “bit” harder than they expected). After the disappointment of the original event being postponed because of thick fog (see earlier blog entry), the 2011 Star Head was finally rescheduled for January 22nd 2011. Despite our concerns that this would also be affected (this time by very strong winds) it did go ahead as planned. Although we’d put together a bumper entry for the original event, unavailability reduced us down to “just” ten crews entered. Out of this entry, we managed to come away with no less than six event wins, with the ladies again proving dominant with three wins and the Ladies Masters’ boat narrowly missing out on handicap time. A strong crew of Helen J, Paula, Alice and Kate (in her first race for MK) with cox Yemin put down a fast time of 7:53 in the first division. This was to prove more than quick enough, beating the Star boat (their only competition) by a substantial margin of 31 seconds to win the category. Another very strong looking boat, with Kate, Alice, Lou and Jenny, with Yemin again coxing. With this being Jenny’s first MKRC race and Kate’s second (her first being the W.IM2 boat earlier) we weren’t sure how it would go. The answer was “quickly”, posting a faster time (7:46) than the IM2 crew, easily enough to again take the win by 28 and 57 seconds over Star and St. Neots respectively. With Jenny switching to sculling and, very creditably, steering the quad in her first ever row at Bedford, the crew of Andi, Amelia, Karen and Jenny overcame the handicap time and sculled to victory, proving too strong for Star and Oundle. Despite not having raced together for a very long time, Tim and Pierre-Yves put in a great performance, not only winning their category but posting the fastest MKRC time of the day! Their time, 7:28, put them 29th overall for the day, comfortably beating many fours and quads and even one eight! Not only taking on their competitors, but running a significant risk of marital fall-out (would YOU let your spouse steer a race or would your spouse let YOU call the pace and tactics????) 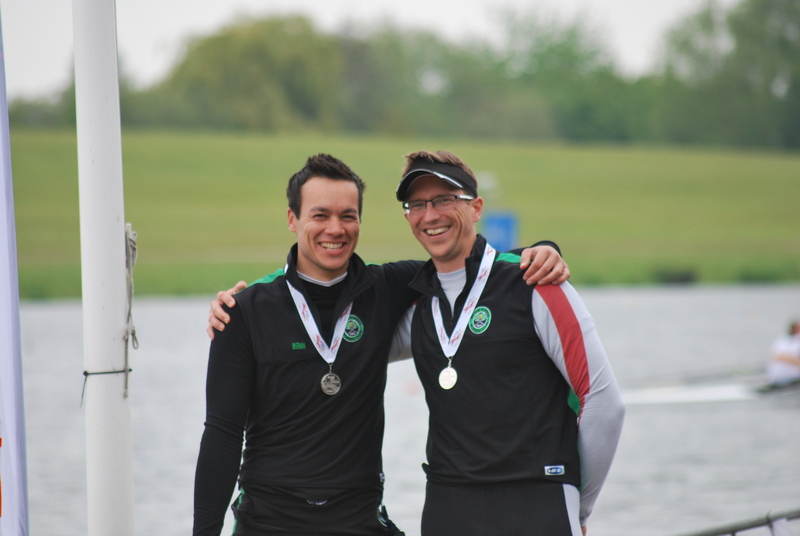 Tim and Andi also beat the handicapping to see off two “C” boats and win the category by 23 seconds and 33 seconds from Oundle and Sudbury respectively. A new combination saw Steve, Pierre-Yves and I swap sculls for sweep and add Chris (in his first MKRC race) to put out an IM3 four. After a “hot swap” as we were sharing Mistral with the Women’s IM3 crew (with Helen J jumping in to relieve Yemin from coxing a third straight race!) we paddled down to the start. Not really knowing how this would go, having had just a couple of outings, we set off at a reasonable rate. Unfortunately, we’d been placed immediately ahead of what was obviously a very quick Star quad and coming up to Star club, Helen had to steer very wide to let them through. Despite this we settled back onto the racing line but as we came through County bridge it was like rowing out into the Atlantic. Very high waves, rough water and boat stopping winds made for “interesting” conditions – a bit like rowing on Caldecotte Lake! This persisted through to the Suspension Bridge where the water calmed down a bit and from the Butterfly Bridge it all really clicked and (for the last 200 meters!) felt really strong and balanced. A good end to a reasonable race but we finished last of the five, but a mere three seconds covered 3rd, 4th and 5th. Still, 30 seconds off the winners in what was basically a Masters’ boat wasn’t too bad, especially not for a first outing and had, we not had to avoid the quad, could have been even better. Despite a very good row, the Ladies Masters were just unable to overcome the handicap (racing “C” against a St. Neots “E” boat) and although 23 seconds quicker, Paula, Karen, Lou and Clare, with Amelia coxing, lost out by 4 seconds on the handicap time. Had Clare not had to do a third straight race (see the WMas CDE 2x- race), maybe they would have been able to close that little gap. James and Alex out in a junior double, were up against two strong crews from St. Neots and Kings School Ely and their lack of experience showed as they trailed in a long way down. Still, they can only get quicker with practice. Alex found himself up against three other J16 scullers, from Kings School Ely, Star and St. Ives. Again, still learning the ropes, he was well beaten although the times posted by the others were extremely fast (winning time was a scorching 7:31!). Clare and Trish, in her first race for the club, had a torrid time. Having raced down in Division 1, they got to the end to be told that their time hadn’t been recorded! They then had to row back, up to the start and do it all over again. This clearly affected their performance and they came in well off the pace with a time of 10:03. Still, a first race together out the way and hopefully next time they’ll only need to do it once! So, all in all, another good day at the races, especially for Jenny and Kate who picked up wins (two in Jenny’s case) in their first races in MKRC colours. A reasonable first race for the Men’s IM3 4+, although last, this was by just a few seconds, so a bit more practice should see us further up the field.